She calved her fifth in November, a really fancy heifer by Solomon. Richaven Sammy Rebecca VG87 sold for 6000gns in the Richaven Elite Sale in 2015 and now has a daughter by Butz-Butler Atwood Brady on the ground. 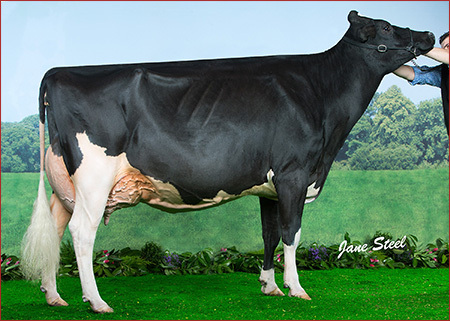 Richaven Shadow Rebecca VG 2yr calved in November 2018 to Solomon, with a fancy heifer by Solomon andshe has two fancy maternal sisters by Control and another sister by Solomon. All these possess the same stamp and show potential as other members of the family.